Believe it or not, Easter is only days away! Winter tends to linger a long time in Chicago and hints of Spring are more common in May than in March, so for that reason I feel like this holiday above all others sneaks up on me. First of all, white dishes. These cabinet staples have served me for every occasion over the last 10 years. (Ours are the Crate & Barrel Aspen; Simply a perfect plate). All of your colors will pop and your food will look beautiful if you start with white dishes. And with so many choices on the market - from Pottery Barn's catering set to the Ikea 89-cent-a-piece plates (no joke! ), there is an affordable option for everyone. It's OK. 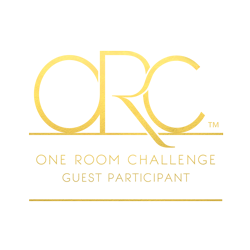 I'm giving you permission just this once to forgo the fancy linens. 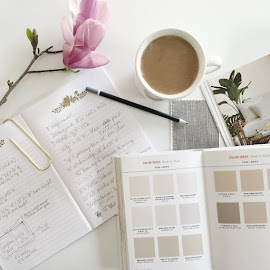 Rather than spinning your wheels and spending extra money to coordinate tablecloths, runners, placemats and cloth napkins, you could give yourself a break this year. You probably bought your table because it was beautiful-- why not show it off? (I did have to make sure to scrape the crumbs and crusted yogurt out of the cracks with a toothpick first...why didn't anyone warn me that kids and plank wood tables don't mix?!) Nevertheless, I love the way the dark wood of our table contrasted against the white dishes and colorful touches, and it was easy peasy to just throw the plates down on it. 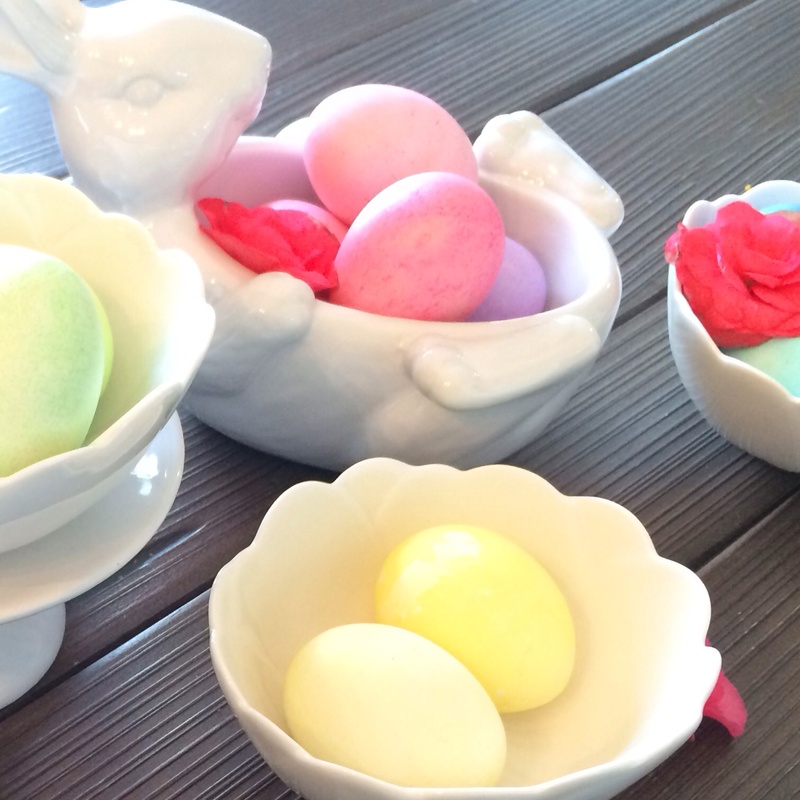 I have a collection of whiteware dishes and ceramic bunnies. Some people collect tea cups or vintage cake stands. Others of you have moms who are collectors, and who are also happy to let you borrow stuff. For everyone else, the Good Will is standing by with a treasure trove of 50-cent vintage bowls. 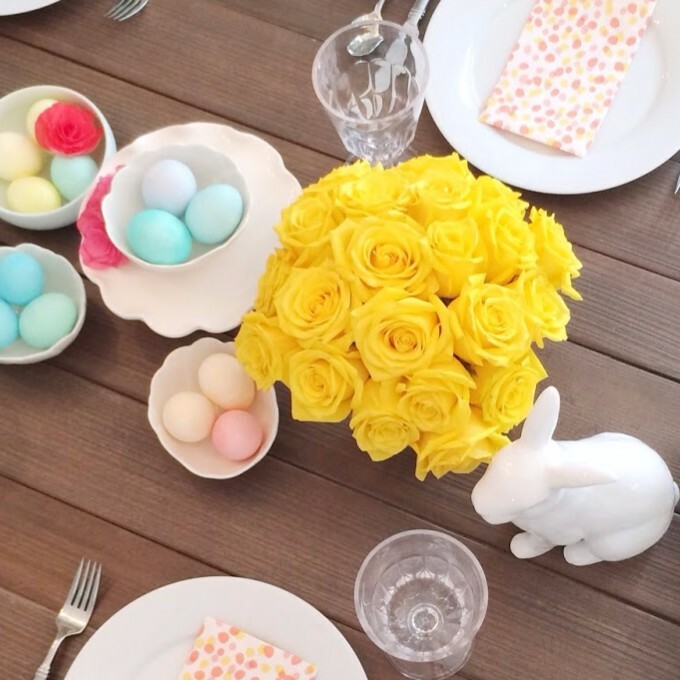 By grabbing a collection of dishware and grouping it in a long narrow line down a table, you'll have visual impact and fullness without the huge expense of extra flowers or tons of holiday-themed decorative objects. 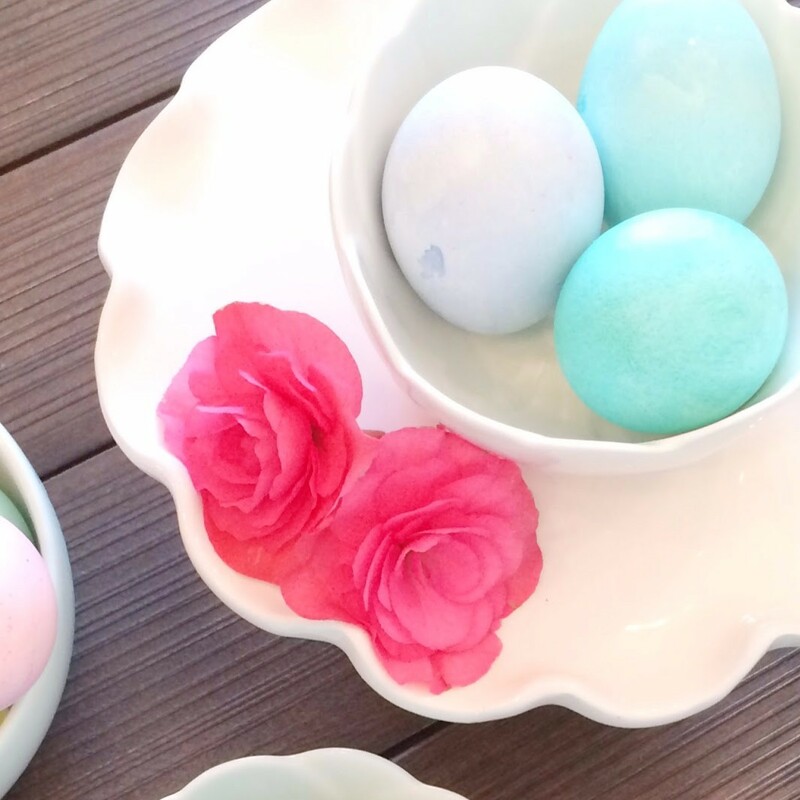 I used varying sizes of white bowls and bunnies, and if you use the Martha Stewart trick of elevating some bowls on cake stands, it will add even more interest. 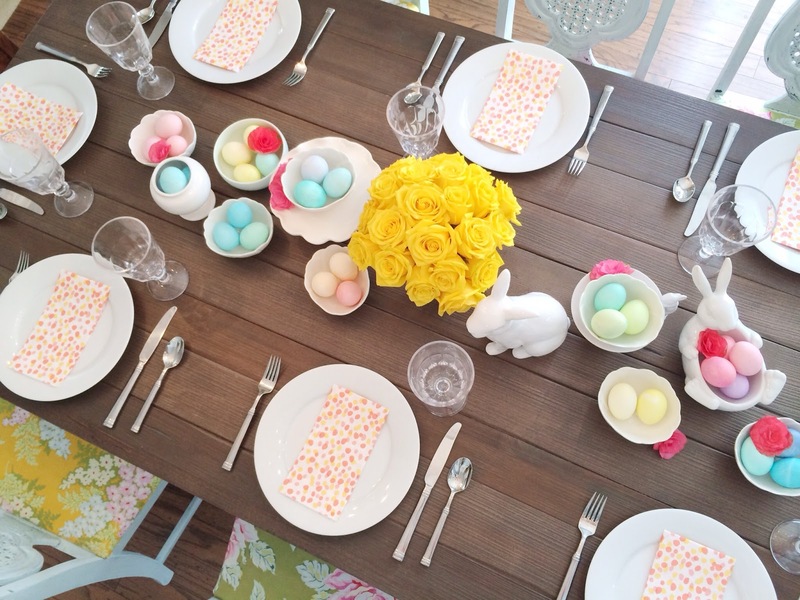 I filled many of the dishes on the table with Easter Eggs. I grouped them with like colors and didn't worry about making them overly decorated or fussy. Simple was the name of the game; All I did was use the standard dye tabs in a Classic Paas kit and dip the eggs once. Just like we did when we were kids. I thought the pastels were so beautiful, I didn't see a need to make it any fussier than that. I chose a bright yellow shade of roses for the middle of the table (all tables do need some flowers, I think). 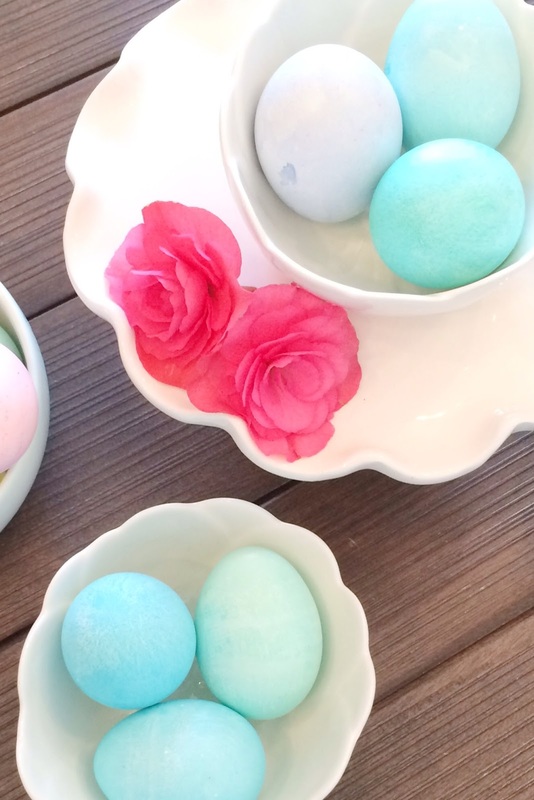 Because the eggs were all so pastel, I felt like bright flowers would bring some life to the table. (Actually it was my mom who suggested this...she is always chiding me-- rightly so-- for being too boring in my color choices). It was also her idea to dot the table with bright pink begonia buds...a touch that really makes the whole thing in my opinion. Doing a rose centerpiece like this is the simplest way to do flowers. And the good news is, roses are pretty much always available unlike some of the other more exotic flowers. Begonias are fairly prevalent this time of year too. I found a potted one last week at Trader Joe's. The nice thing is, the rest of the plant can sit in your entry or powder room (minus the handful of plucked blooms), and then you can plant it outside once the ground thaws. I'm hoping this year to keep it equally simple, but pretty. I wasn't sure where to go with it until a package showed up in the mail this week. My "aunt" Wanda sent me a turqoise glass cream & sugar set and candle sticks that belonged to my grandmother Kate! I was beyond thrilled and touched, and instantly started envisioning them as the stars of my Easter table amidst a sea of varying shades of blue with white tulips. Dancing girl emoji! Thank you so much Wanda! Oh, P.S! 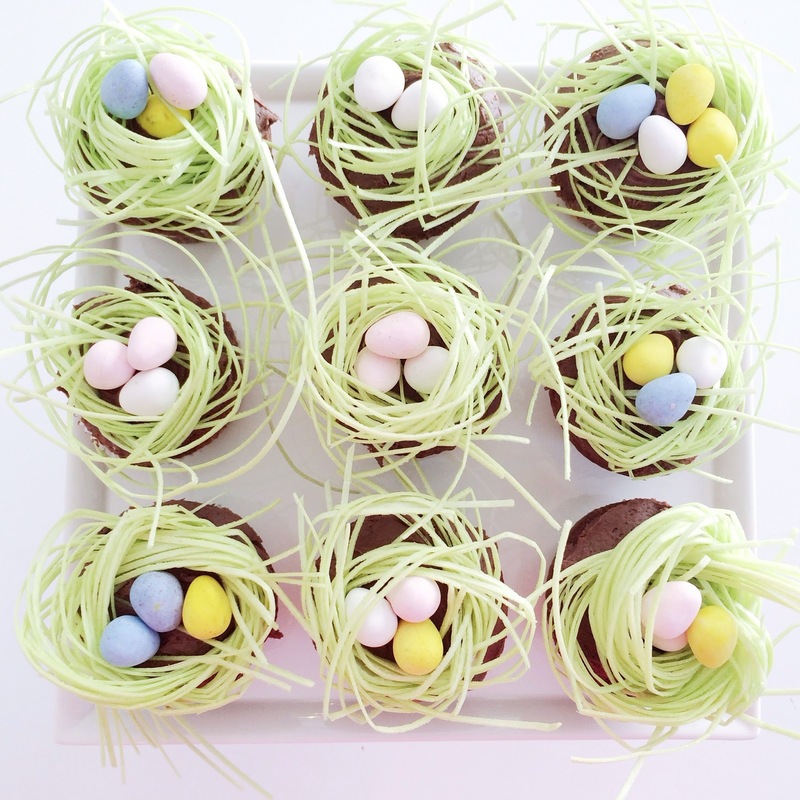 I have to mention that I shared at the Entrusted blog how to make these easy and cute bird's nest cupcakes. Check them out- they're just too darling not to share! You can also see all the photos from last year's Easter here. That was way back when nobody read this blog, haha! I'm really thankful I'll get to spend another year with my friends Travis and Stephanie and their gorgeous kids (and maybe even Steph's gorgeous mom- hope you can come Caron!) In any case, it's always more fun to set a table for company. What are your plans?? I hope it's a wonderful Easter wherever you'll be. Jesus is alive! YES! Hello! 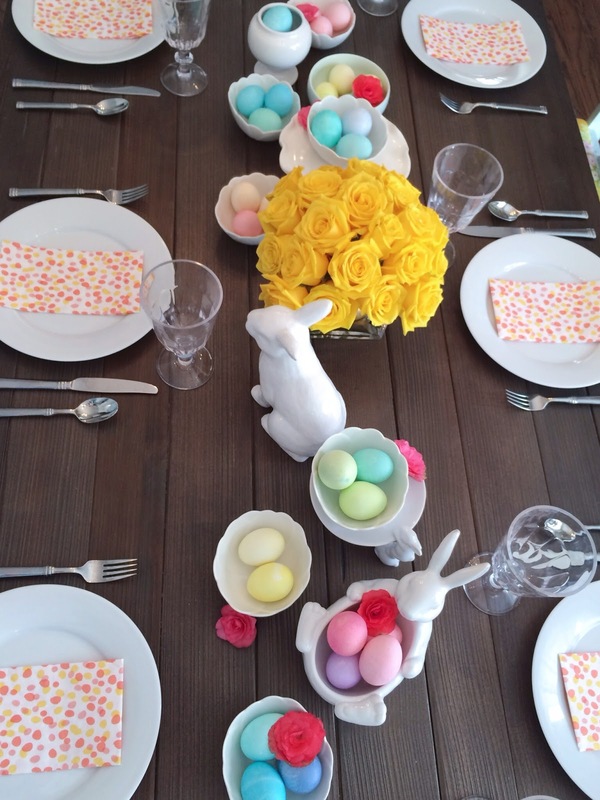 I love your Easter table! 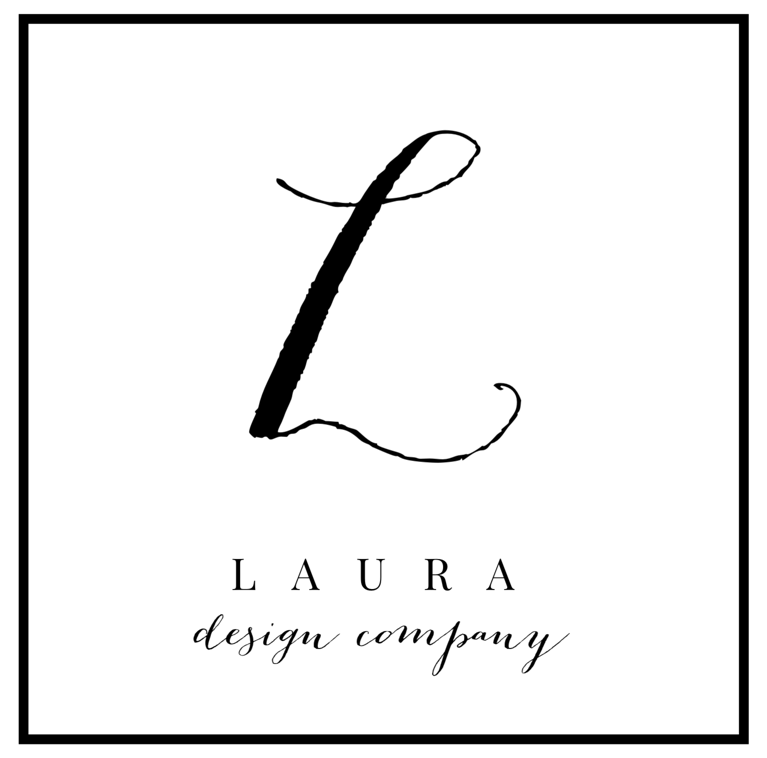 I'm all for simple and pretty ;) I also have white plates from Crate and Barrel ;) hugs! Hi Ursula!! Thank you- aren't those plates the best?! 10 years later and no chips or scratches. I am wildly impressed. xo! 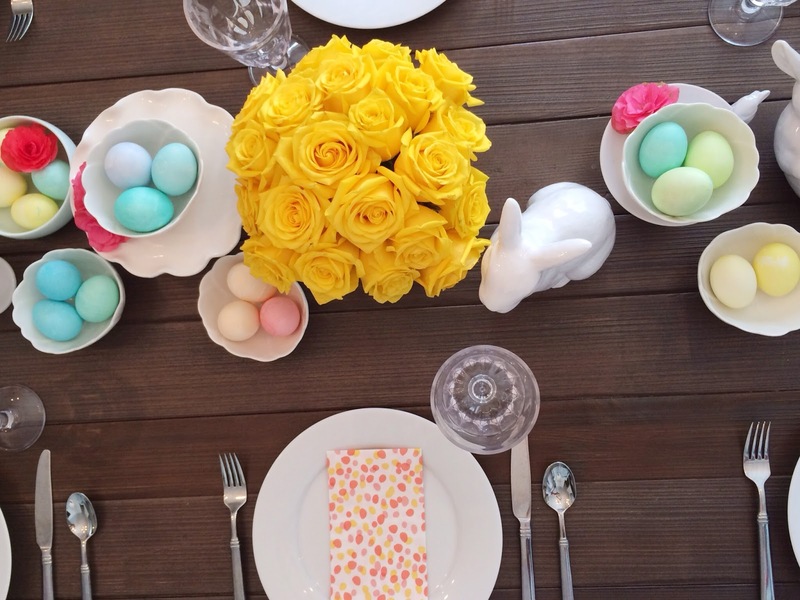 I had the joy of being a guest at this Easter table last year, and it was even more beautiful in person than in pictures! Of course, being with my family is the best blessing of all :) Happy Easter!